Many regular readers will have noticed the formatting and layout of free Christian resources change over time, and recently a big new change has been made. The home page has been altered from effectively being just a summary of recent additions, to being a more useful summary of the best content. 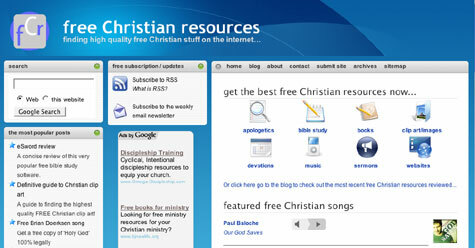 Also, I have moved the address of the website from www.blog.freechristianresources.org to www.freechristianresources.org. This should not impact you in any way as any old links will automatically divert to the new address. If you subscribe to the RSS feed there is no need for you to change anything as the address for this is the same. However, you may have noticed in your feed reader you had the ten most recent articles delivered twice. This was simply a “side-effect” of the move! As well as highlighting the best content on free Christian resources, the homepage will still include a summary of recent additions. Hopefully you like the change, it has mainly been made to help new visitors navigate the site. If you still prefer the blog-style layout though then you can still access this view simply by clicking on the ‘blog’ option on the top menu bar, or by clicking here. Simply change the current homepage that you look at to include ‘/blog’ at the end. I have also removed the old search box at the top right of the page and made the google search option more prominent. This was because my testing showed the google search option was far superior to the results provided by the internal search. There will be a few other changes over the coming months as I improve the presentation further – as well as yet more great free Christian resources being shared! Please let me know if you can think of any ways I can improve the site.